Alas, two more creatures which are so beneficial to us are on the decrease and once again it's down to the changing environment of fewer hedgerows, ponds and insecticides. Most of the time Frogs will be found under stones or in a nice cool damp spot around the Garden. They will use Ponds for spawning in early Spring and in Summer just to literally 'chill off'. Male and female get together after hibernation, usually February / March time depending on climate. This is the time you will often hear them croaking - either looking for a mate or claiming territory with another frog. They lay their frog spawn in a shallow part of a pond. After that it's onwards to tadpoles and newly developed frogs. 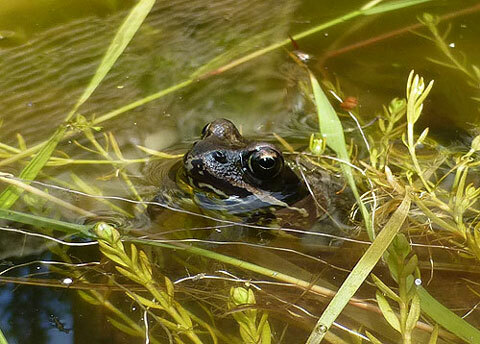 Attracting Frogs - If you have a Pond, ensure the frog has a way out. If the sides are too steep they will become trapped and eventually die. Plus of course any new one's will not be able to get out. Bear in mind that fish will eat frog spawn, you can help avoiding this happening by laying a few stones around the frog spawn to protect them. For housing adult frogs, try a small stack of old roof tiles somewhere cool and damp. Hibernation - They will find muddy ditches, some males prefer a muddy bottom of your Pond. Finding a Toad to some can be pretty scary, they're big, dark and not the most attractive of creatures found in our Gardens. BUT, they are a great friend doing much to especially benefit a Vegetable Patch. I've found they tend to live in the sides of borders, especially if there's overhanging grass and it's pretty damp. The don't go into water so much as Frogs. One year I left an old roof slate angled between the soil and the top of the border - a Toad (picture) took up residence there for a good six weeks and didn't seem to mind me pottering around him doing a bit of weeding etc. 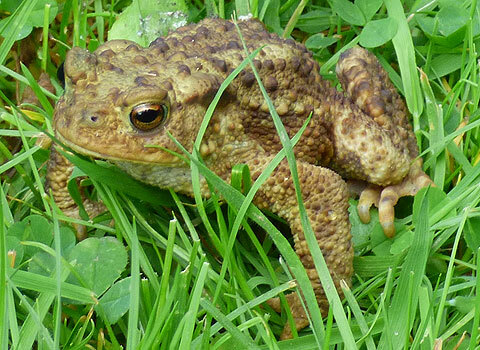 Toads eat mainly insects, worms and slugs, so if you see one around the Veg., do all you can to keep him there! You can see in the photo which I took during the day a rather stupid Slug has decided to share the Toad's residence.....easy fast food there! After hibernation Toads return to the same pond to mate and spawn every year. It's at this time that road kill is at it's highest. 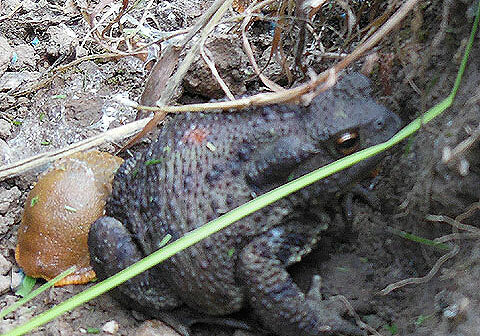 Toads lay spawn in long 'strings' rather than clumps. It is estimated that only 5% of their young one's survive. Frogs and Toads are both very important in nature's chain, so anything we can do to stop the population decline and increase the numbers is a wonderful thing to do.